Austin Slater was selected by the Giants in the eighth round and was the 238th pick overall in the 2014 draft. The Stanford University star is originally from Jacksonville, Florida where he was considered the top high school prospect in the state before he broke his ankle during his senior year. The injury dropped his draft position to a place where he was still available for the Giants. Scouts from both the Giants and the Major Leagues consider Slater to be a quality prospect with potential to be a starter in center or left field. His power numbers increased dramatically in 2016 where he had his best season as a pro. Slater has risen quickly through the Giants Minor League ranks where he began his career as a second baseman and has become one of the top ten prospects in the San Francisco system. 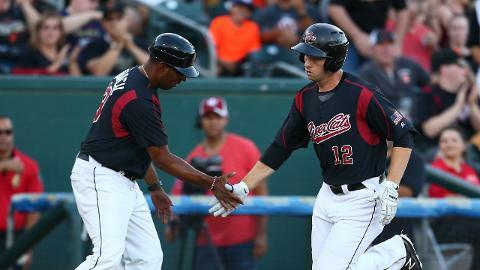 Last year the organization moved him to the outfield and in 68 games as the center fielder for the Sacramento River Cats Slater batted .298, hit 13 homers and drove in 42 runs. Together We’re Giants: Congratulations on a great season. Your homer and RBI totals were both career highs. To what do you attribute the surge in home run power? Austin Slater: Thank you! My power numbers were definitely something I wanted to improve upon going into this last season. I think RBI’s tend to be a result of power numbers. It wasn’t until the second half of the season that I was finally able to consistently drive the ball. I would attribute the surge to a slight tweak in my stance that helped me to elevate the ball as well as a more patient approach at the plate, which consequently helped draw more walks. It is something that feel I can continue to improve upon going into next season. TWG: What has been the most difficult adjustment you have had to make transitioning between different Minor League levels and teams? AS: From a hitting standpoint, each level provides new challenges because the pitchers have a more refined approach and better control. For me the most difficult adjustment has always been finding a balance between what I do best and understanding how the pitchers at that level are attacking me. The transition from team to team is not as tough as it seems. The Giants do a great job during spring training of creating camaraderie among all levels. After a year or so in the organization it seems like you know just about everyone. TWG: What was your favorite baseball team growing up? TWG: What was going through your mind when you discovered you were drafted by the Giants in the 8th round of the 2014 draft? AS: To be honest, it took a couple days to fully sink in. At the time when I was drafted, I was still finishing up my final collegiate career. It wasn’t until the season was over that the excitement hit me and I realized I now had an opportunity to play baseball professionally. TWG: What is your timeline for getting to the Big Leagues and making the Giants roster? AS: Unfortunately, that decision isn’t up to me. All I can say is I am excited about the prospect of going to big league spring training next year to show the front office and the coaching staff that I am ready to move up and help the big league club win games in 2017. TWG: Are you open to playing a different position if it means a faster path to the Big Club? AS: For sure. I would say versatility is one of my greatest strengths. I played second base my first full season, but spent all of last season in the outfield playing all three positions. I hope to show that to the coaching staff this spring training. TWG: What managers and coaches have had the biggest impact on you through your journey as a baseball player? AS: That’s a tough question to answer because there are so many great coaches and inspirational figures throughout my baseball career spanning back to my days as a youth that I know I will forget to mention. Within the Giants organization Jose Alguacil has been a tremendous help to me over the last two years. He has helped me with understanding the intricacies of the game and improving my defense when I was playing the infield. Andy Skeels and Damon Minor both had a large impact on my development as a hitter this season both from an approach standpoint and a mechanical standpoint which lead to my success late in the season. TWG: What would you say has been your greatest achievement as a player so far? AS: I would have to say winning the player of the month award in the Pacific Coast League for August is definitely one I am most proud of thus far in my career. I had a rough first two months in Triple A and I take pride in the fact that I was able to work thru my previous struggles and bounce back in August.